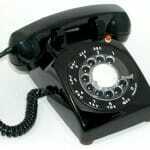 Are You Using a Rotary Phone on the Internet? How many know what this is? Does your nonprofit or business use a rotary phone? Of course not. Push-button phones are everywhere. 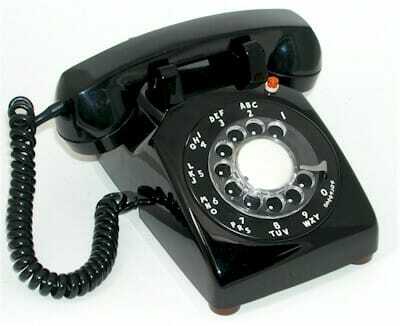 When younger people wonder how to use a rotary phone, they have to look it up. But are you using a rotary phone on the internet? The answer is “yes”–if you’re not using social media. Yes, you have email. That’s the rotary phone of the 21st century. You can still use it to get in touch, but it’s slow, and talking to more than one person at a time is awkward. Yes, you have a website. That’s like being in the phone book. Most people these days are throwing phone books away as soon as they receive them. Being listed does you no good if people don’t have a reason to call. You have a blog? Good! A step in the right direction! But it’s a baby step–like putting your phone number in a print ad. What makes people want to get in touch with you if they don’t know you already? Social media let you meet people in a relaxed environment. You get to know each other. People begin to like you, perhaps even trust you. They tell you more about themselves. When it comes time to ask them for something, you know what might appeal to them. But they might actually approach you first. That’s why it’s worthwhile using social media and using them well. Because you don’t want to wait by the phone. Call it a funnel. Call it a cycle. However you see the process of winning loyal supporters for your nonprofit organization, there are three steps you want those supporters to take. No matter how strong you, your programs or services may be, you will still be ignored by prospective donors, volunteers, and other supporters until they know, like, and trust you. My colleague Patrick McFadden wrote about this for small businesses. It is just as true for nonprofits. So, do you want to be ignored? If so, you can stop reading right here. If you want supporters, though, read on! It’s a truism: people can’t support you if they don’t know you. So how do we get our nonprofits to be known? Word of mouth. If their friends tell their friends about you–face to face or through social media–that’s the most powerful recommendation. Blogging. Answer the questions people are wondering about and they will come back for more. Social media. Yes, you can use Facebook, Twitter, etc. to put your words out there, but it’s even better to find people who should be supporting you and actually talk with them. That’s why they call it “social”! So, you must get permission by a) being likeable and b) giving them a good reason to want to hear more. “Likeable” is Dave Kerpen‘s trademark. The same qualities that make us likeable in real life can help our organizations win likes on Facebook (for instance). We ought to think like the people we are trying to attract and give them what they need. Read his book for good advice on how to do just that. While you’re developing “the Know” through articles, posts, and referrals, “the Like” through your website, newsletter, and ebooks, you’re still not fundraising. Be patient. Write blog posts that readers are eager to read. Deliver your newsletter or email updates consistently. Post content on your website that’s so valuable reputable websites will link back to it. Participate in social media by sharing great information and helping others find what they want. Help your prospective supporters before you ask them for help. What’s one thing your organization does to get supporters to know you? Like you? Trust you? Please share it below in the Comments section.